It was not easy to wake up. I was massively jet lagged and needed many more hours of sleep when my alarm went off around 7:15. However, we had to be out and at the visitor center by 9am for our glacier hiking tour. So I quickly got ready and scarfed down some leftover pasta for a carb-heavy breakfast. We drove in a chilly mist through a moon-like landscape of barren black volcanic soil, sometimes accented by pockets of moss and lichens. We arrived at the glacier tour center at 8:55 and were quickly outfitted with harnesses, helmets, ice axes, and crampons for our shoes. An old American school bus drove us to the base of the glacier. Along the way, the four of us were trying to drink a cup of coffee each and spilling it everywhere thanks to the bumpy ride; we were laughing most of the way. The bus dropped us off at the end of the dirt road, a 10-minute hike from the base of the glacier itself. 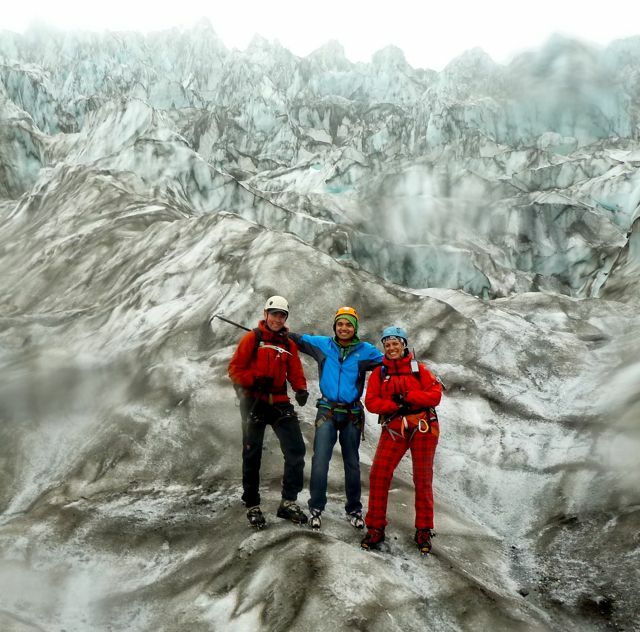 We had two glacier guides, Sivollina (from France) and Danni from Iceland. They led us to the glacier, where we strapped on our crampons and walked (either cowboy-style or Charlie Chaplin-style) onto the glacier itself. The glacier was actually nearly black, covered with volcanic ash from the recent eruption of the Grimsvotn volcano nearly a month earlier. 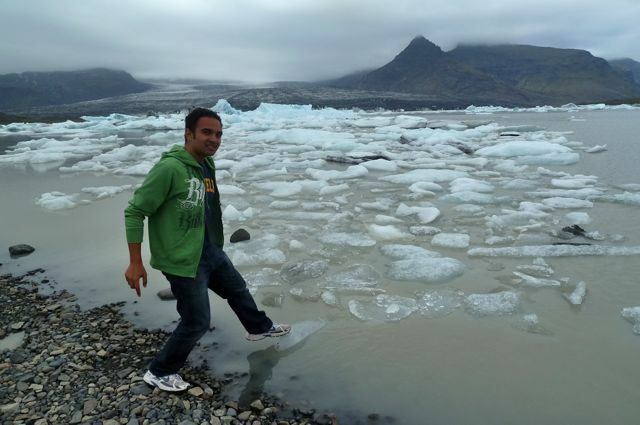 We walked past many moulins, holes in the glacier through which meltwater flows like a river. We then climbed halfway up the glacier, until we couldn't climb up much further, and here we had a small lunch of sandwiches. It was amazing, despite the weather being misty and drizzly. We then returned to the visitor center, left our stuff there, and got a guide to figure out where we'd be sleeping that night. We left around 2pm, heading east along the ring road. It wasn't long until we saw an amazing river leading out from a small lake filled with icebergs. We pulled over and walked over to take in the spectacular view. Icebergs everywhere; you could see them breaking off and floating downriver. I ate a piece of an iceberg. We continued on to the bigger, more well-visited glacial pool, which was about 25 minutes further down the road and had several motor rafts taking some tourists on a tour of the glacial lake. More amazing views, more crystalline icebergs. We detoured inland, taking a gravel road shortcut for about 40 km, and much of the way it paralleled a river flowing to the sea, with cataracts and waterfalls appearing very frequently. We saw a group of reindeer! We stopped an took pictures while gaping in awe. The road emerged near Egilsstaðir, and we turned from there onto another highway that led us high into the snow. We were fogged in, with snow at either side, and it felt lie a completely different world yet again. It's amazing how diverse the landscapes of Iceland are. We soon descended down the winding road, with small streams flowing into the valley from all sides, and there were even more waterfalls cascading down everywhere! It was one of the most picturesque landscapes imaginable. At the bottom was the town of Seyðisfjörður, where we stayed for the night. We had our own room in the hostel, and there were few other people there, just a group of silent people. We made dinner - fish balls and potatoes, which was very good. Then we slept, this time with no set time to wake up.